I cried out to God to hear me When I was in distress, I sought the Lord at night I stretched out untiring hand and my soul refused to be comforted (Psalm 77) "Many Christians struggle with prayer . . . and most of us are afraid to talk about it," writes W. Bingham Hunter in the opening of this brief, honest and comforting booklet. He continues, "God commands us to pray (1Thes 5:17), and prayer is one of the deep desires of the redeemed heart. But we are stalked by the cynicism and skepticism in our culture and assailed by doubt. The disappointments of unanswered prayer erode our faith and discourage persistence. The pervasive presence of disaster, evil and injustice make us angry. Pain and suffering magnify such feelings and may completely overwhelm the ability to pray. "In teaching on prayer, the truths of Scripture are often replaced by sweet thoughts and speculation, and opportunities for honesty about what pain and suffering do to us are avoided. However, what theologians and philosophers call 'the problem of pain' has challenged the people of God from their earliest days. There are people for whom it is largely an intellectual issue, but for most of us, suffering is personal. "Pain may be physical or mental, sorrow and suffering may be short-term or chronic, and encounters with evil may be personal or vicarious. Yet whatever their nature, the consequences are often the same: Much of the time it is impossible to pray; and when something does eventually come out, the words are questions--often filled with anguish and anger." 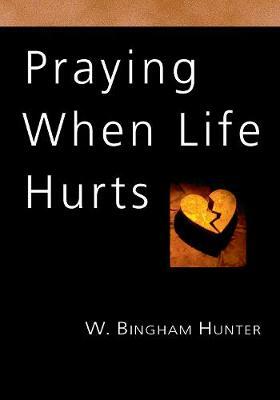 Here Hunter tackles how to pray when life hurts both personally and practically. Drawing on his own experiences, passages from Job and Pslams, and the writings of contemporaries like Joseph Bayly and Philip Yancey, he offers no simple answers. Yet he also points to what we can be sure of: "the historical fact of the cross and the resurrection of the Lord Jesus Christ, of His victory over pain, evil and death--the fact that God took our suffering into Himself."